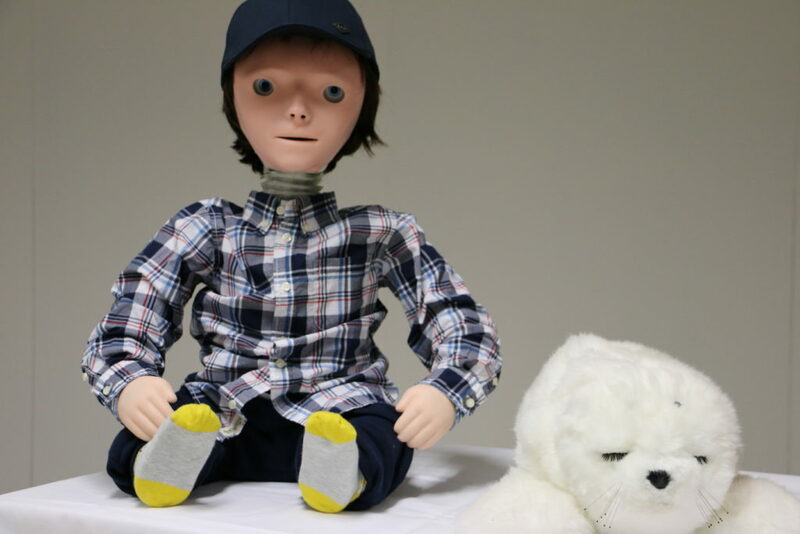 Kaspar and Paro, two of the social robots we’re trialling to support children with autism. For some children on the autism spectrum, developing academic skills, as well as communication and social interaction skills can be a significant challenge. Children with autism may sometimes be more engaged or at ease when interacting with technology, so digital tech is often used to support their education. While it’s generally considered safe and effective, there’s still a challenge to make sure children develop skills that are useable in the real world – not just in the virtual world. This is where a little robot called Kaspar comes in. Kaspar is a programmable, childlike robot developed by the University of Hertsfordshire in England for children with autism, and researchers from our Australian e-Health Research Centre have been trialling him in partnership with the University of New South Wales. Our project lead, Dr David Silvera, says that while Kaspar might look a little unnerving to an adult, he’s actually appealing to children – and his limited facial expression helps them feel more comfortable with him. “This is important, as we’re looking at whether he can help students develop their social and communication skills,” David says. David and his team have written software modules for Kaspar. A therapist then sets the little robot up to act out certain behaviours or social situations, and children practice those situations with the robot – with the goal of helping them learn how to deal with similar social situations in real life. Kaspar is one of four social robots David and his team have been trialling as tools in education and therapy, partnering with UNSW, Murray Bridge High School in SA, and Autism Spectrum Australia (ASPECT). The other robots include Robotis, Nao, and Paro – Paro is a furry baby seal lookalike that responds to touch and that children can find relaxing. What’s next for Kaspar and friends? We’re still evaluating our results, but so far results suggest social robots like Kaspar could be effective tools in supporting education and therapy for children on the spectrum. David says children who have interacted with the social robots for a while have started to see improvements in verbal communication, participation, and social interaction – and most importantly, we’re starting to see some of this transfer to children’s interactions with other people. We’ll keep collecting evidence and modifying the programs, so the robots are as beneficial as possible and easy for teachers and therapists to intergrate as part of their everyday classes and sessions, in the hope of making this technology as accessible as possible for schools around Australia someday. Curious for more info about Kaspar and our digital health research? Get some feel good science. Any advance for children on the ASD spectrum is a good thing.